Kaeser’s H series dryers are hot gas by-pass valve-controlled for reliable performance – even when operating in ambient temperatures as high 110°F . Constructed from high-quality, industrial materials for a long service life, these dryers offer a very low pressure drop. Our proven stainless-steel heat exchanger technology maximizes performance and produces dew points as low as 38ºF. Integrated automatic drain trap quickly and automatically removes condensate for optimum dryer performance, and the reduced footprint minimizes space requirements. Constructed from high-grade, industrial materials for a long service life, these dryers offer a very low pressure drop. With our specifically designed hot-gas bypass systems, highly efficient refrigerant circuits and electronic “no air loss” condensate drains, every aspect of the H Series refrigerated dryers is designed to provide outstanding quality and performance. The dryer’s stainless-steel plate heat exchangers are copper-brazed. All dryer components and piping meet the highest standards in quality and reliability. 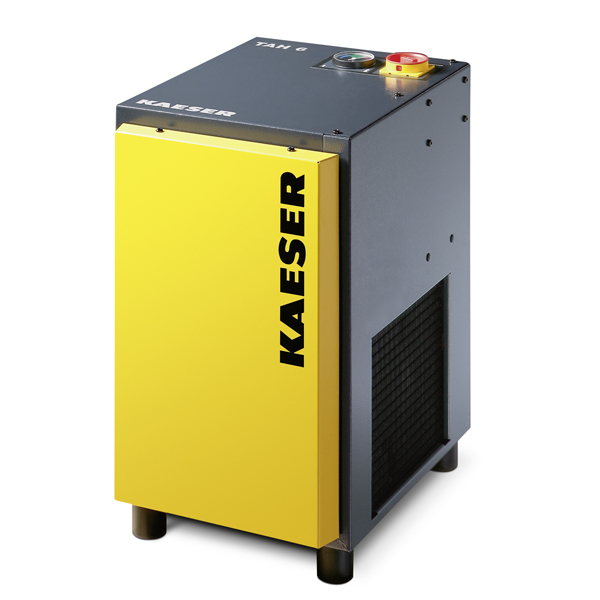 Kaeser’s H-Series refrigeration dryers are designed for maximum reliability. They are equipped with a specially designed condensate separator made from corrosion-resistant stainless steel that reliably removes condensate from the air even under fluctuating airflow conditions.